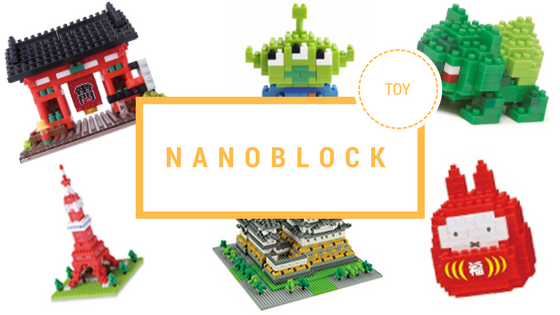 Nanoblock is a small block construction toy similar to lego, however, the blocks are nano. Each block is the size of 4x4x5mm and is manufactured by Kawasa Co. Ltd, a toy company based in Tokyo, Japan. Nanoblocks were created for adults, with the aim of relieving the everyday stress of being an adult. From beginners to experts there's a Nanoblock for everyone. "Fun to create, fun to decorate, fun to collect"
Nanoblocks are a huge hit worldwide and have collaborated with a number of characters and brands including; Rilakkuma, Be@rbrick, Pokemon, Street Fighter and many more. The Mini Collection Series includes designs of famous characters, buildings, musical instruments and seasonal themes with all sets having about 80 to 150 blocks. The Sights to See Series includes designs of famous landmarks, buildings, and historic items with all sets having about 200 to 600 blocks. The Advanced Hobby series is similar to Sights to See but on a much larger scale with over 2000 blocks. Doraemon, Evangelion, Miku, Pokemon, Disney and so many others. If you are a former LEGO fan, why not try Nanoblocks?